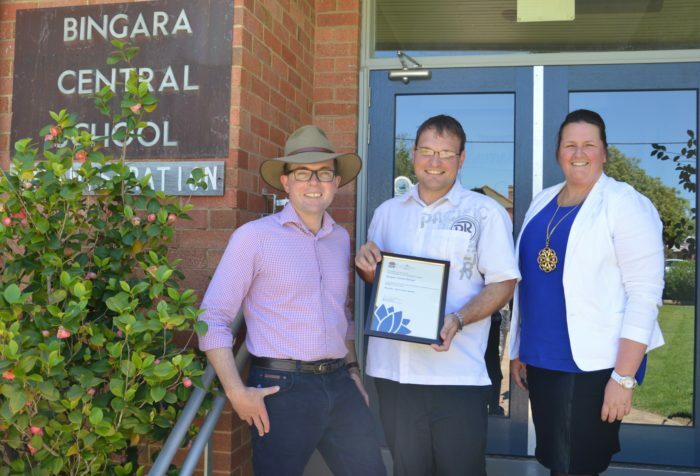 Northern Tablelands MP Adam Marshall, left, with teacher Scot Crispin and Bingara Central School Relieving Principal Brooke Wall, show off the official paperwork for an Eco Schools grant that students will use to create a bush tucker garden. SCHOOL students from Bingara will get their hands really dirty in the coming weeks following a State Government grant to allow them to start planting out a new native bush tucker garden, according to Northern Tablelands MP Adam Marshall. Mr Marshall has delivered news of the $3,500 in funding to the Bingara Central School under a NSW Government Environmental trust program. “The grant will go towards buying seedlings and plants for a new dedicated bush tucker area in The Living Classroom green space just outside Bingara,” Mr Marshall said. “So besides getting lessons in environmental science the students will have some practical work in landscaping and cultural and culinary experiments too. “The Living Classroom was established just over five years ago on the old Common and has become such a great asset for the town and a magnet for tourists and visitors. A 20-metre by 20-metre pod showcasing swamp, stream, forest, woodland, grassland and arid landscapes will form the centrepiece of the Nourish – Bush Tucker Garden place. The secondary school, combined with the local pre-school, Gwydir Shire Council and two Landcare services agencies are partners in the new project. “The students and pre-schoolers are involved initially and in an ongoing capacity with this and they’re going to be physically helping to plant out some of the indigenous plants that will form the backdrop for it,” Mr Marshall said. Bingara Central School has around 200 students, and along with teacher Scot Crispin, many will now combine their weekly outdoors environmental studies at the plot with a practical experiment in Aboriginal and Torres Strait Islander history and culture curriculum lessons. The project will come under the guiding hand of The Living Classroom co-ordinator Rick Hutton who says the garden will be built off the designs of University of Queensland architectural students who provided initial concepts for it a couple of years ago. And off the back of a visit by West Australian indigenous chef Mark Olive, and his ideas of delicious and edible food types, the bush tucker garden will see wattle seeds, passionberry, nardoo, quandong, bush raisins and bush citrus, and even macadamia and mangoes, as well as other native plants like kangaroo grass and yam daisy, go into the ground. Mr Marshall said chef Olive’s menu of kangaroo, emu and crocodile, with root and vegetable sides, on his last visit to Bingara, had provided additional inspiration for the plantings.